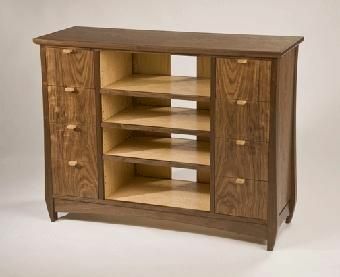 This entertainment unit is made using solid walnut and figured walnut veneers. It was designed to be used with a flat screen LCD or plasma TV. The drawers are sized to fit DVD's, and the shelving is adjustable to accomodate a variety of stereo gear. This was a commissioned piece but I can replicate it for you to suit your specific needs. You can add on pocket doors if you like (for an upcharge) and I can make the piece out of any species of wood to suit your taste. Dimensions: Dimensions are 46" wide by 36" tall by 16" deep.